There’s something about rainy days that makes you crave for soup. Although it is no longer winter, spring in Orange somehow attracts lots of rain and the residual chilly temparature from winter still lingers. I couldn’t help but to say BRRRRRRRRRR at the thought of the weather I’ve been enduring of late. Despite my minor whinge, the plus side of a (tolerable) chilly weather is I can still layer my outfits. Thankfully long sleeves & thick cardigans are still weather appropriate otherwise how on earth am I going to hide my baby lovehandles and flamingo arms developed over the course of winter? I’m not the type to go on a full fletched celebrity diet like Atkins or raw food diet. The furthest I might go on “dieting” probably eating less or others may call eating with moderation. 😛 I must say I might have overindulged during winter under the pretext of needing all the sweets, cakes and dessert I can buy/bake to keep me warm. 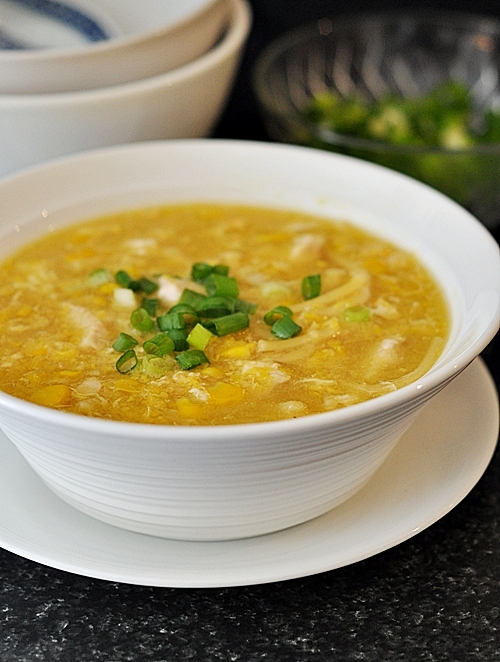 Anyway back to my chicken corn soup. As you may know it is more an appetizer rather than a meal. Although I do like the idea of myself cooking 2 course meal (mainly main course & dessert if I do), I don’t really make appetizers at home. That said, there’s nothing stopping me from turning a popular Asian appetizer into a main course by adding strands of spaghetti right? While most chicken corn soup recipes require canned creamed corn, honestly, it is one of those ingredients that I rarely use. So frozen sweet corns kernels are my substitute for creamed corn and guess what, I personally don’t think it makes any huge difference. Overall, it’s a pretty easy recipe and perfect for cold rainy days. Enjoy! 1. Bring to boil chicken stock into a pot together with ginger and knotted spring onion on medium flame. Tilt the lid a little to ensure the stock does not overflow. 2. 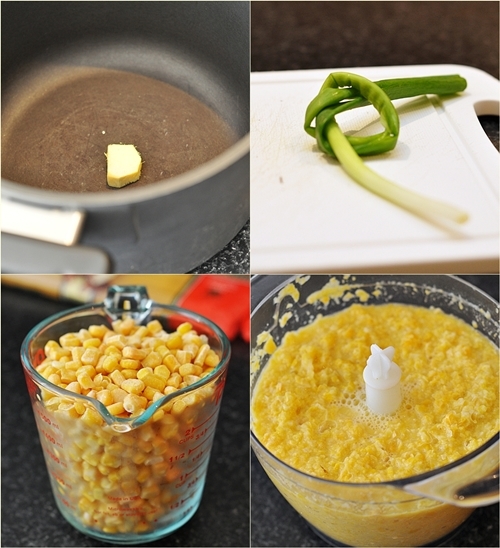 In the meantime, pour some boiling over 2 cups of the sweet corn (keep the rest aside) and use a food processor to process until fine & creamy. (Remember to keep an eye on the stock). 3. 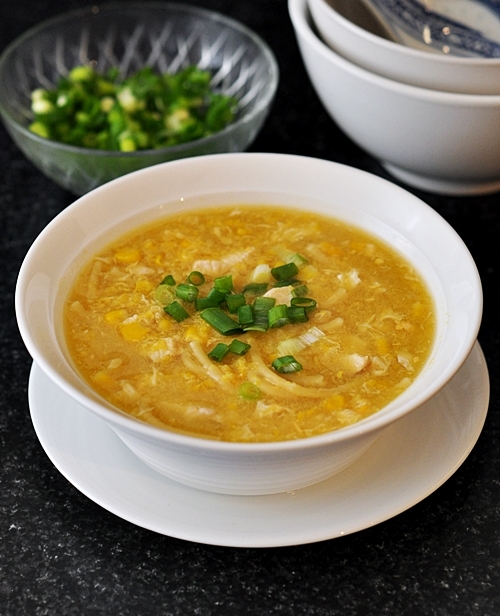 Tip in the sliced chicken breasts, blended corn mixture and the remaining unblended sweet corn kernels into the soup. You can also add the spaghetti broken into short pieces into the soup as well. It should take about the same time for the spaghetti and chicken to cook. 4. Once the chicken is cooked and pasta is soft, remove the knotted spring onion and ginger. Add soy sauce and a little salt to taste. It all depends on how salty the stock is as you may need to skip the salt if you use pre-made stock. 5. Mix cornstarch and 5 tbsps of water and set aside. Increase the flame until the soup is bubbling vigorously, pour the cornstarch mixture and stir well. 6. Keep the soup bubbling until slightly thickens. 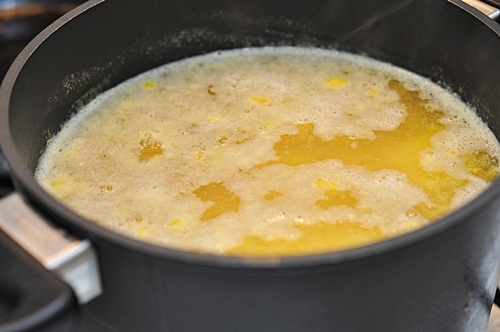 Then pour the lightly beaten egg over the soup and stir gently. 7. Lower the heat, add a tiny drop of sesame oil and white pepper. Garnish with spring onion (optional) and serve immediately as the spaghetti will continue to expand the longer it stays in the soup. Emily’s note: If you think you’re not going to finish the soup immediately, cook the spaghetti separately and add it in individual soup bowl when serving. This way you don’t have to worry about the spaghetti getting expanded and becomes overcooked in the soup. <Added on 20th May 2011> Also, the color of the soup may vary depending the type (or brand) of soy sauce you use. I have people asked me about the color of their soups looked slightly darker than mine. For this recipe, I used Naturally Brewed Soy Sauce by Kikkoman. This soup looks so inviting especially it’s chilly here today. I can’t believe summer has come to an end! 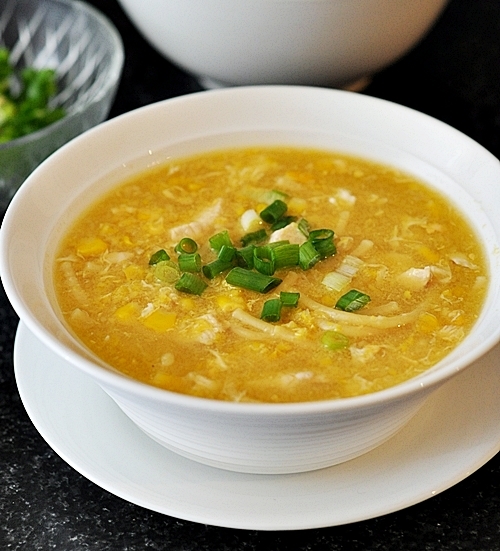 This soup looks so delicious, so comforting…yummie! I always enjoy this as starter at our local Chinese restaurant and think it would make a great main course! Thanks for the recipe…already made it twice and it will undoubtedly be a staple in the winter soup rotation. This recipe is AMAZING !! i have just made my first batch, it smells and taste perfect. I doubled the recipe so i could freeze some and take it to uni. I encourage anyone to try. very cheap and healthy! will definitely make over and over again and pass this recipe on thank you.